Our network is comprised of individuals and organisations working together to maintain and improve the Kedron Brook water catchment environment. Coordinated community effort, education and awareness will ensure an environment that is fit for ourselves and future generations to live in. 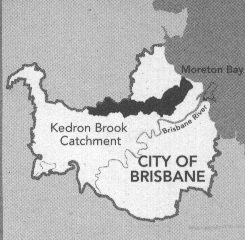 Where is the Kedron Brook Catchment? Our catchment is located mainly in Brisbane City and partly in Moreton Bay Regional Council area in South East Queensland. The Brook eventually flows into Moreton Bay near Nudgee Beach. We encourage your participation in helping support the brook's environment. You can help out at home, at work, in the community or at school. Business & Industry can play their part in helping. You can also join a volunteer Bushcare Group or other environmental group to work towards our catchment's health. We welcome you to join our network or contribute to our website's ongoing progress. Our website is maintained by network volunteers. Although mainly an urban environment, our Brook offers us places of beauty and interest. 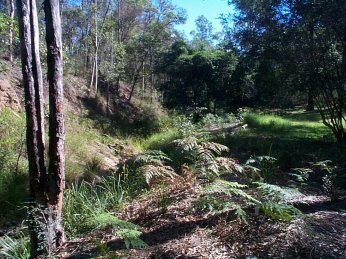 This restful scene is part of the area managed by the Wahminda Grove Bushcare Group in the upper reaches of the brook. After the removal of weeds, regeneration of native ferns is visible in the foreground. Keep up to date with our activities by a regular check of our News or Diary. How can you send us your own news items? Check out our Contact us section. While there, find out how you can become a member of our Network and become an email subscriber to The Kedron Brook Babbler. Our network acknowledges the great help by its members in maintaining and upgrading this website through provision of information and administrative support. You'll find it's easy to surf around our website. Just use the main banner and side navigational links. You'll find plenty of the blue hightlighted links throughout our pages. Try the Google search facility on the home page. Google does such a nice job of drilling down into the content of our web site. Take a good look around, enjoy yourselves and come back soon! The Kedron Brook Catchment Branch of the Wildlife Preservation Society of Queensland Inc supports our network's operations. WPSQ are one of Queensland oldest and most respected environmental organisations. We thank Brisbane City Council for their support, particularly through their intial assistance with the original development of this website within ourbrisbane.com's Online Business and Community Development Program. The support and cooperation of the management and staff of Moreton Bay Regional Council is also gratefully acknowledged.